There are so many things to do in Burnsville, NC. A sightseer’s paradise, Burnsville and the surrounding area is filled with indescribable countryside adorned by magnificent natural wonders. Farmhouse on the Cane located just outside of Burnsville, NC is located in the Blue Ridge Mountains which is part of the Great Smokies with breathtaking views and natural scenic landscapes, begging to be explored. With the highest average elevation of any county in North Carolina, we are home to six of the tallest peaks east of the Mississippi, including the highest, Mount Mitchell. Bordered by the Blue Ridge Parkway to the southeast and the Appalachian Trail to the northwest, the area is a haven for outdoor enthusiasts. From lush forest lands to tumbling rivers, Yancey County provides countless opportunities for outdoor adventures. You’ll also discover working art and craft studios and art galleries tucked throughout our scenic mountains. Hiking trails ranging from easy “walks” to advanced technical climbing can be found in the Black Mountains and Toe River Valley near Burnsville, North Carolina. The area has a wide variety of terrain to explore ranging from lush river valleys to majestic mountain ridges. At 6,684 foot elevation, Mount Mitchell is the highest peak east of the Mississippi. Numerous trails, including the spectacular and challenging Black Mountain Crest Trail, can be accessed from Mount Mitchell State Park located on the Blue Ridge Parkway. North Carolina High Peaks Trail Association offers several guided hikes through the year. Roan Mountain is another beautiful area which has great hiking and hosts the Rhododendron Festival every year. The Cane River is located just a few steps away from the Farmhouse. Take a dip, swim or grab a tube and relax in the water. 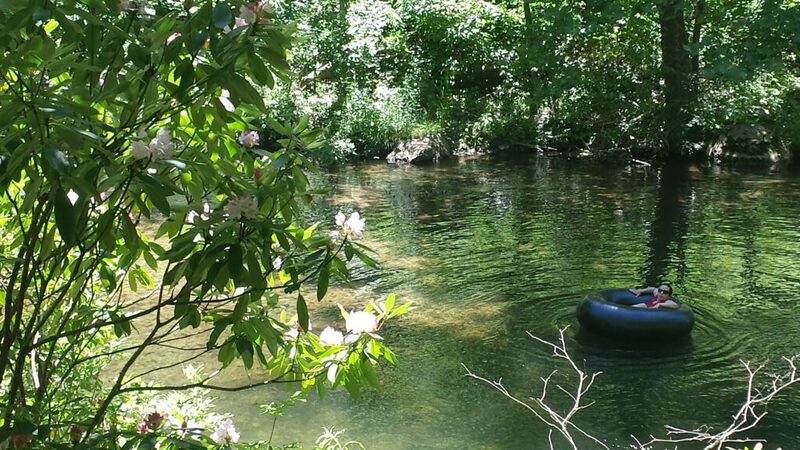 In addition to the Cane River, Loafer’s Glory Tubing and Rafting offers organized tubing trips and rafting on the Toe River. There are a couple great waterfall excursions in Yancey County NC. Some of our favorites are Roaring Forks, Crabtree Falls, and Setrock Falls. Linville Falls is located off the Blue Ridge Parkway and makes a good day trip. The Cane River in Yancey County just outside of Burnsville NC boasts Brook, Rainbow and Brown Trout in headwater streams, in additional to Smallmouth Bass. There are many creeks and rivers ideal for fishing throughout the County. For fishing and hunting supplies be sure to visit Prices Creek Store. Southern Drifters Outfitters and Burnsville Anglers are local experts and have several day trips and fishing lessons available. A fishing license is required in the state of North Carolina.